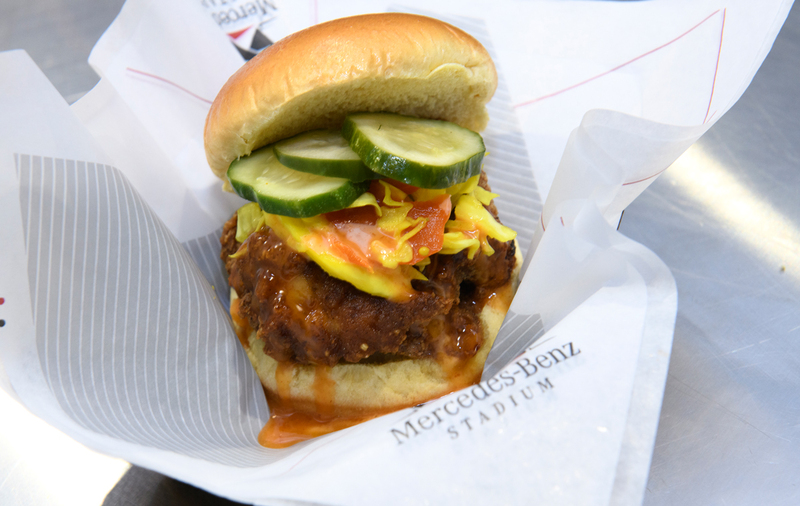 If you find yourself in front of the West Nest concession stand on 300-level of Mercedes-Benz Stadium, you will come across employees busily serving up chicken sandwiches topped with homemade pickles. It seems no different from any other concession, but it’s actually a training ground for students and graduates of the Westside Works program. Westside Works’s culinary track provides free training on how to work in a restaurant kitchen, eventually offering graduates a path to Atlanta food service jobs. West Nest serves as a place for program graduates and a hands-on training ground for students. Wages there start at $11 an hour. West Nest sits on the 300-level of the stadium. West Nest has been preparing for more than a month for Super Bowl LIII, researching and developing its Super Bowl menu, which will include chicken and waffles with sorghum butter and West Nest hot sauce. The team conducted a test run during the Chick-fil-A Peach Bowl college football game on December 29 to determine any last-minute tweaks before the big game, such as equipment issues or adjustments to the number of staff. “It’s a good gauge to make sure we’re coming out of the gate with a new menu properly,” Peters says. Students have a hand throughout West Nest. Photos of Westside Works graduates—from not only the culinary track but other program areas such as construction and information technology—grace the wall between the front and back of house. Students picked the stand’s name and determined its signature item: a hand-breaded chicken sandwich topped with honey, pickles, and Doux South chow chow. Students and graduates also contribute ideas for the menu. Peters says one staff member recently proposed adding lemon pepper wings, though it hasn’t made its way to the menu yet. 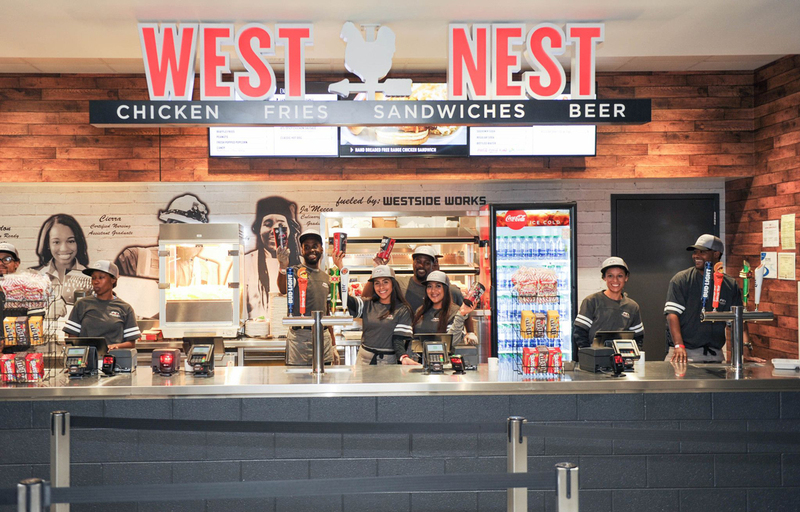 Though Westside Works’s culinary track started four and a half years ago, West Nest opened in August 2017 for Mercedes-Benz Stadium’s first ever event, a Falcons preseason game. Peters says working at West Nest is an incentive for students who arrive to class at Westside Works on time, keep their uniform clean, and practice proper kitchen safety and sanitation. 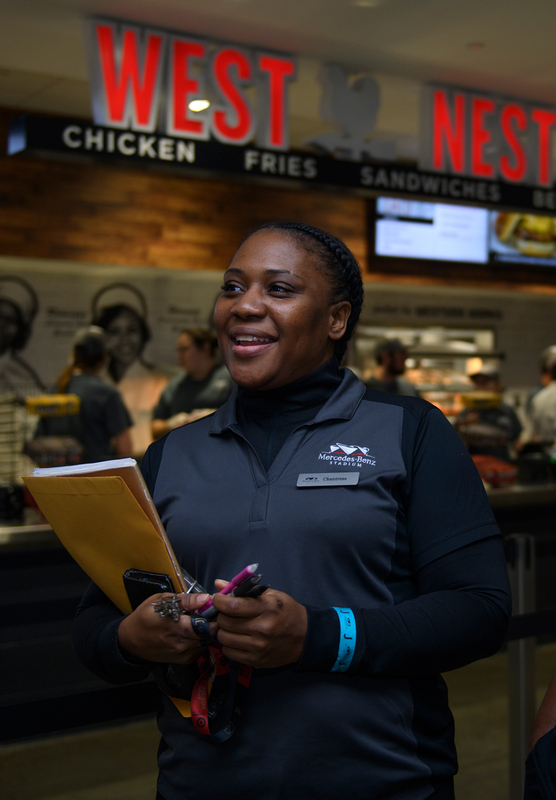 When class is in session, four students usually work at West Nest, and in all, the stand has 10 to 12 employees working during an event. Though Peters typically hires only students and graduates, she has taken on potential students who are exploring their interest in the industry. Local nonprofit groups also occasionally assist with front-of-house duties during larger events. Most staff members work 9 to 10 hours during game days, so they often hold other jobs. But West Nest management staff, in addition to working game days, work an additional 20 hours leading up to an NFL game. They learn how to properly store food, do inventory, and manage the flow of food—all knowledge that they can use elsewhere in the future, Peters says. She says she’s proud to be part of West Nest and sees the pride that students and graduates take in their work at the stand.